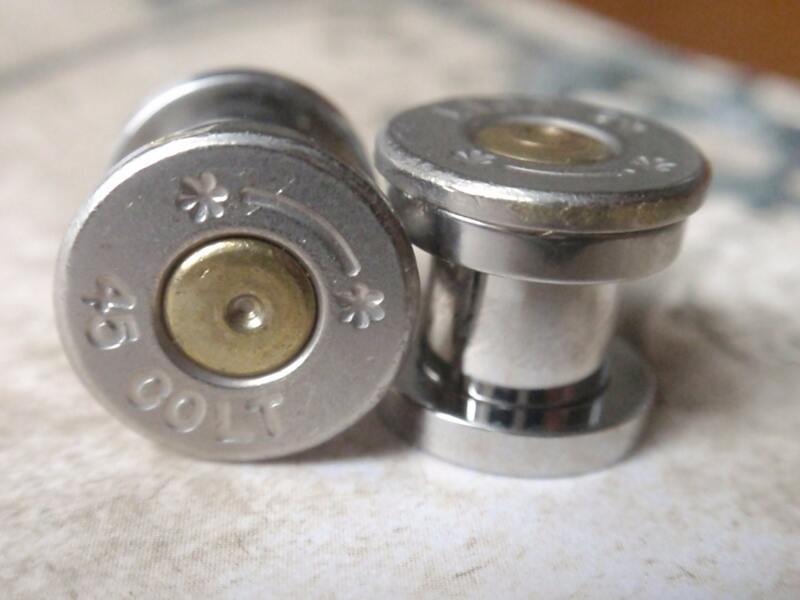 Super hot set of Bullet Plug Earrings Bullet Shell Earrings Bullet casing earrings that will set you apart. Forged from genuine Nickel brass bullet casings, the casings were first carefully emptied via a bullet removal tool (gun) and collected. These shells are made of Brass with a nickel plated firing pin in the center, I then cut, de burred, tumbled, polished them. They are then mated to a high quality 316 Stainless Steel tunnel (you pick the size) with a super cool screw on backing! these are so easy to use and look awesome! You will get attention when you wear this set, so YOU WERE WARNED! 0GA is what is shown in photo, due to size of shell the outter edges of the plug and bullet casing other sizes will line up differently. A few kind words from some of my past customers who have purchased one (or more) of my (Artifacts N Relics) Bullet Shell Creations. An absolutely wonderful online shopping experience! fantastic. bought these as a unique gift for my brother and he loved them! exactly as described. thanks! 100++ Quick conversational responses and shipping! Looking exhaustively for an extremely unique gift for my Boyfriend I was to the verge of giving up and just giving him a tie for christmas. Miraculously I stumble upon these magnificent cufflinks! My boyfriend is not only an avid fan of antiques and war history, but he also possess an extremely high standard of elegancy. This item is not solely a conversational piece but also a fashion statement. Once I got them, I bragged about them to all my creative work team at the office that followed by a huge WOW, they proceeded to admire it's incredibly well crafted and detailed construction. This precious item arrived promptly, nicely wrapped and on top of that, is impeccably beautiful! Many Tnx! I know my boyfriend is going to love it as much as I do! EXCELLENT set! Wore these babies to Sturgis, and they were a huge hit! Fantastic idea! Seller was prompt, professional...excellent communication, very helpful! All in all, I'd have to give this site a big thumbs up!! Got here in record time and my husband LOVES them. Thank you! These are stunning! I fell in love with them as soon as I opened the package! These cufflinks exceeded my expectations. They are well made and worth the money. The weight of them is great and the seller shipped them very quickly. These came out so great, thank you so much for doing the all silver post for me!! You rock! These look awesome! Can't wait for my hubby-to-be to wear them on our wedding day! What an awesome idea! Everyone who has seen these loves them. Thanks. Such Awesome Earrings. Thank you so much they arrived so fast and I can't wait to rock them! High quality, love them! Communication with seller is great and shipping was done quickly. Will be buying again at some point. So cool! They are perfect for the costume I needed them for. And great quality!